Nissan and Microsoft teamed to hold a technology open house at Nissan headquarters in Franklin, Tennessee to encourage young women to enter the science and technology fields. It featured former Tennessee Titans cheerleader Jennifer Hill, now a process engineer at Nissan. Like most companies today, Nissan is struggling to find enough qualified engineers and science experts to fill its roster. The company says that they struggle to find enough qualified engineers for their needs and only about 18 percent of those who apply are women. 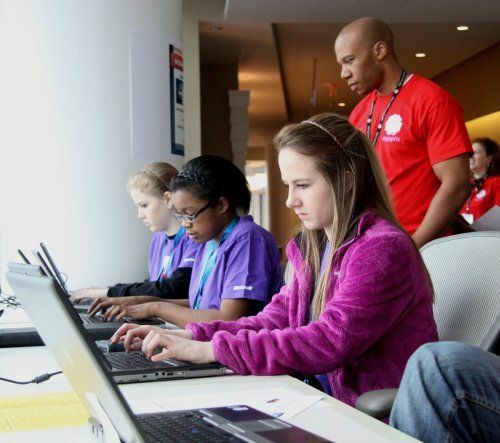 To bolster those numbers and encourage young women in high school to enter science and technology fields, Nissan held a technology open house titled DigiGirlz in cooperation with Microsoft at Nissan Americas' corporate headquarters in Tennessee. The event featured former Tennessee Titans and Nashville Predators cheerleader Jennifer Hill, who is now a process engineer and manager at Nissan Motors. "I wanted to dance and I also wanted to pursue a career in technology, and I decided to do both," said Hill, during a keynote address at a DigiGirlz event hosted at Nissan Americas. The event is one that Microsoft holds regularly around the country, its DigiGirlz program being a corporate-sponsored showcase of the technology various industries have for young women interested in going into science, technology or engineering fields. The program encourages girls to consider these fields and see the career opportunities available to them if they do. In Nissan's case, it also showcased how someone with a love for one thing (in Hill's case, dance) can pursue that while also pursuing a career in tech. As you'll see in the video below, the speech Hill gave was inspiring to the girls in attendance, who were glad to see that it wasn't an "either-or" choice, but instead could be inclusive with no dream left untried. Nissan is aggressively expanding its technology base and capability, having recently opened a new facility in Silicon Valley to pursue vehicle safety and self-driving technologies.